Well, we’re surviving here after a bout of bronchial pneumonia and the departure of our very helpful son who has been with us since before Christmas. It has been a time of gaining perspective and receiving new zest for the next projects in our lives—for me a novel titled Catching the Sunlight and for Dale, the beautiful arranging and performing of hymns. The Inspiring Cuisine cookbook continues on its progress at our new publisher, Deep River, and we’re hoping it won’t be long till we have the book in our hands. We’ll let you know as soon as the momentous day arrives. But for now let’s make some evening momentous by trying out Dale’s simple, but elegant new entrée. After work on Tuesday I hurried through my work-out at the YMCA, and then raced to catch the bus home. There I did my hour of piano practice; then it was time to make dinner. I was especially hungry because all I had for lunch was a banana and a Clementine orange. I had tossed a frozen pork chop into the refrigerator before leaving for work, so it was ready to cook. What could I do with a pork chop that was quick? I didn’t want to just fry it; I wanted something good. I looked around my kitchen. Aha! There was the bag of my favorite little oranges, right there on the counter top. Clementine Oranges! I got to work and in no time I had something worthy of a fine restaurant. It was so nice that I served it on my best china. You have days like that—too much to do and not enough time. You’re tempted to throw any old thing together without much thought or effort. I know what that feels like. So here is a great recipe for when there isn’t enough time. Seldom will you find anything this elegant that can be done with such ease. Squeeze enough Clementine oranges (Sometimes they are labeled “California Mandarin Oranges”or “Cuties”) to get 1 cup of orange juice. Add the tablespoon of corn starch to the orange juice and stir. Peel four of the Clementines and break the segments apart. Pull off any of the white strings that are loose. You probably won’t need all of the segments but you can eat all that you don’t use. 1. Spread the sliced almonds on a sheet pan and toast them for about 4 to 5 minutes in a 350 degree oven. Set a timer or watch them closely because they burn easily. Just a very light brown. These are for your garnish. 3. Dry the pork chops with a paper towel because moisture inhibits browning. Saute (medium heat) the pork chops until lightly brown. 4. Put the chops on any pan or tray and lightly salt them. 5. Place the chops into a warm (your lowest temperature setting) oven to hold. They will continue to cook. 6. Add the Grand Marnier to the sauté pan. Enjoy the aroma. 7. Add the orange juice/corn starch mixture to the pan and stir until it thickens slightly. 8. Add the sugar and cloves. Stir and taste. More sugar? cloves? More butter? Is the sauce thick enough? Make any needed adjustments. 9. 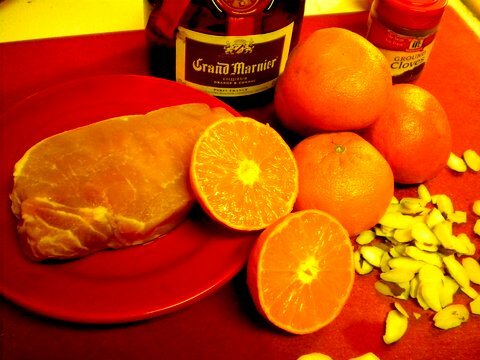 Take the sauce off the heat and stir in the orange segments. You don’t want to cook them; only coat them with the sauce. 11. Garnish with the toasted almonds. 12. Steam some broccoli and dinner is done! When I first saw Dale’s Pork L’Orange recipe, I wanted to try it immediately, to jump right into it and experience the smoothness of a well-thought out plan. I wanted to participate in Dale’s achievement of elegance. Our casual society could benefit from an increase in elegance. Gone are the respectful “Mr. and Mrs.” addresses, the customs of dressing up for dinner and the gracious wearing of hats. We wear jeans to church and baggy pants to school and grab fast food for supper instead of stirring up something nutritious and comely that cheers the soul as well as the body. What we are missing is a consciousness of the importance of civility defined as refinement or polite consideration. Every time an elderly gentleman opens the door for me with a sweet smile, a shaft of light strikes my soul. Ah! The olden times. Elegance is the young man who greets me on the stairs to my watercolor teacher’s studio with, “Hello, how are you today? Are you going to Studio V? I can show you the way.” Elegance is the glow of candlelight on the dinner table. It’s a black dress with only one accessory—a delicate silver watch. It is the simplicity of a watercolor depicting two shivering wrens on a budding twig. It’s a gracious word instead of an angry reaction. The fruits of the spirit constitute an elegance of the soul: love, joy peace, patience, kindness, faithfulness, gentleness and self-control. If all Christians could practice these and transmit them to the people in their sphere of influence, our culture would abound in civility. I Corinthians ll:3 speaks of cultivating “the simplicity and purity of devotion to Christ.” What a challenge! It invites you in, makes you want to participate, and its result is an elegance of soul that will last for all eternity. 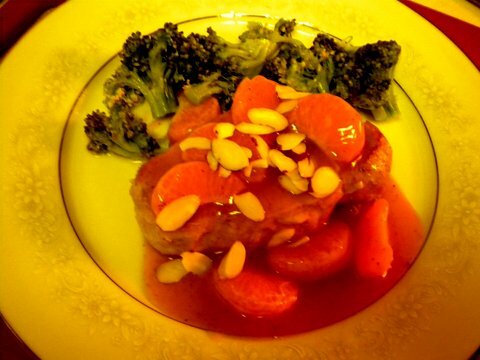 This entry was posted in Entreés, First Steps in Gourmet Cooking, Sauces, Uncategorized and tagged Clementine Oranges, Elegant Dinner, Pork Chops, Simple Dinner, Too little Time. Bookmark the permalink.